Consequences of plagiarism & plagiarism "rules"
Women make up only 24% of the workforce in STEM. What are your opportunities? How can you make an impact? How can you support others in pursuing their dreams? Come to our panel of STEM employers and faculty to learn more about the opportunities that await you and how to support others. This workshop discusses the advantages and disadvantages of various channels and provides suggestions for choosing the right channel to get your message across. A panel of professionals from Conexus Indiana will discuss the ever growing manufacturing logistic industries. This would be a great opportunity for upper level OSCM students or freshman and sophomores with undecided majors. About Conexus Indiana: Manufacturing is evolving- it's high-tech, innovative, and driven by explosive growth productivity. In Indiana, we're on the cutting-edge of these trends. And here at the Crossroads of America, we know how to get our goods quickly and efficiently into the hands of customers across the nation and around the world. Now Indiana has another advantage: Conexus Indiana, an initiative to capitalize on emerging opportunities in advanced manufacturing and logistics, aligning resources and expertise to make Indiana a leader in these exciting industries. Conexus Indiana is focused on issues like workforce development, exploring new market opportunities and building research and supplier networks to help Indiana manufacturing and logistics firms succeed. The case analysis process can be applied to analysis of real world business problems. Summer Internship? Graduating and moving to your first job? How do you make a good first impression? What is important in the first 3 months? Learn about some of the pitfalls to avoid as you join us as we discuss transitioning from college into your first career. Learn the difference between an Entrepreneur, Entrepreneurship & Startups. How to tell if you should go into Entrepreneurship. Interested in receiving a scholarship for having an internship? If so, attend this session to learn more about the Focus Indiana, Rex Breeden, Job Shadow, and Out of State Internship Scholarship. Understand the different types of conflict, conflict styles, and conflict resolution methods. Learn to identify different conflict styles and know strategies for communicating with and navigating. Have the skills to facilitate a difficult conversation. What is growth and mindset and so? Indiana State University prides itself with being ranked nationally as #1 in public service. Sycamores are fantastic at giving of their time, talents, and resources. However, did you know that volunteering is an excellent way to gain experience, enhance skills, and to network professionally? Attend the workshop to learn how volunteering can help prepare for a career after graduation. How to make those immediate decisions with a new job- benefits, housing, utilities, etc. Is this a today problem? ISBDC: How Can it Help You? Entitled, lazy, sheltered... You have heard what people say about your generation. We believe this generation is the positioned to leave a legacy. Learn how others before have and what you can do to use your business degree to leave a legacy. 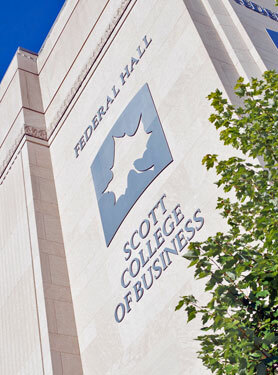 Scott College of Business Alumni will return to share their insight and experiences regarding graduating, entering the workforce, and starting your career off strong. Employers are using LinkedIn more and more to recruit, hire, and network with potential candidates. This workshop will give you the tips and tricks of navigating LinkedIn to network, research potential companies, and use as an effective job search tool. MyPlan helps students and professionals plan more fulfilling lives by making well-informed decisions about their education and careers. Whether you're deciding on a mjor, planning ahead for your first career, or thinking about making a career change, MyPlan can help you explore options and bring clarity and insight into figuring out what's right for you. MyPlan includes a personality test, interest inventory, skill profiler, and values assessment, as well as a career database, video library, and salary calculator. Non-Profit organizations are often thought of as places you volunteer. However, there are a variety of jobs that contribute to the success of any non-profit company. This presentation covers the benefits of working in the non-profit sector and all the opportunities that go with it. This presentation will be employer lead. The term “professional” means different things depending on the environment and the people making the policies. This session will cover what is commonly accepted as “professional” behavior in the job search and in today’s work environment. This presentation will discuss utilizing social media in the job search, interview and workplace attire, professional communication tips, and strategies for making a successful transition into your first job. In order to have an excellent resume, it must go through the editing and revision stages. This workshop will allow you the opportunity to work with a Career Advisor and learn how to use our Resume Rubric. Help your resume stand out in the stack of applications by learning how to customize it for specific jobs and internships. It is strongly recommended that students bring a hard copy of their resume to get the most out of this hands-on workshop. What can you do today for your career tomorrow? Learn the difference between personality & temperament and its implications on your career. Identify the different types of temperaments & how they act. Learn the strengths and weaknesses of each temperament and their ideal job environments. Working with Difficult People: Is It You? Wut Msg R U Sending?